On Moonstruck, we’ll hear from astronauts, engineers, politicians, and space decision-makers. 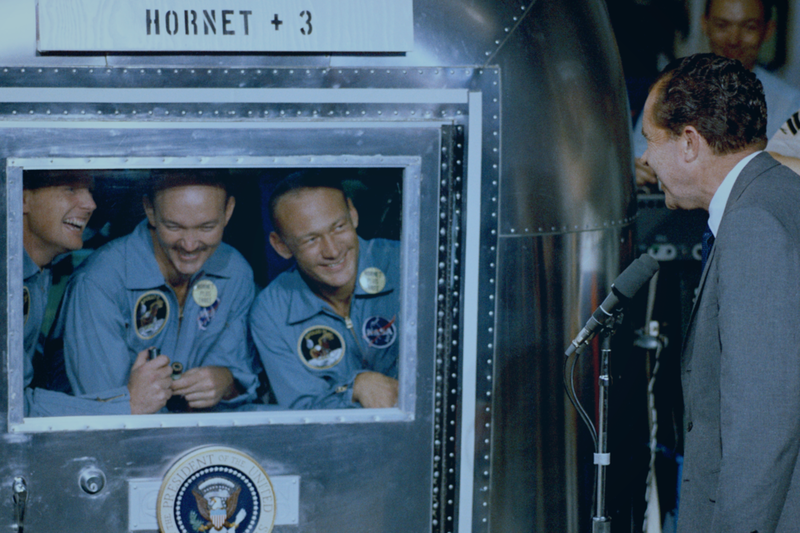 They’ll tell their stories from the history of human spaceflight, sharing how their time at the edge of human understanding taught them about themselves and the rest of us on the ground. We’ll also look at moments between the greatest accomplishments and painful failures, tiny windows into feelings a bit more familiar to us all: suspense and relief, comfort and fear. It will not be one man going to the Moon. It will be an entire nation. We’ll take these moments—small glimpses from an outstanding chapter in our world’s story—and use them to think about how we use space today, what questions we’re asking, and what comes next in the greatest human pursuit of exploration. You’ll get a seat at the table alongside researchers and leaders on the forefront of the next chapter in human spaceflight. Throughout history, humans have had a dangerous pattern of challenging the bounds of Earth's gravity, testing our limits, and expanding our world. In 1965, two nations raced to complete the first space walk—that is, sending an astronaut outside of the spacecraft's cabin, and into open space. On this episode of Moonstruck, hear why the space domain is so dangerous with the story of Alexei Leonov, the first space walker. Invisible to the world, silently moving at 17,000 miles per hour, a cosmonaut was dying. Before there was Yuri, there was Laika. When the first human astronaut left Earth’s atmosphere in 1961, both the American and Soviet space programs had spent years testing the environment with animal passengers. Now, as we push deeper into space, the human body confronts new challenges. This time, in the era of long-term space travel, we're the test subjects. This week's episode of Moonstruck features Dr. Kris Lehnhardt, an emergency physician focusing on aerospace medicine. Flying the world’s first astronaut meant sacrificing her at the same time. When the Apollo 11 astronauts landed on Earth's surface after humankind's first trip to the Moon, their journey wasn't over yet. Concerned about the possibility of lunar pathogens infecting the astronauts, NASA scientists quarantined the crew members for 21 days. Now, as humans prepare to return to the Moon decades later, we're faced with a different kind of planetary protection issue: preventing the spread of our own germs to other worlds. This week's episode features John C. Stonesifer, the NASA engineer in charge of quarantining the Apollo 11 crew upon their return to Earth after the first lunar landing. It was an exciting life, and one of the best jobs a person could have. After the Soviet Union launched the first woman to space in 1963, the U.S. waited over twenty years to do the same. Despite their proven fitness to live and work in the space environment, women were not considered for early NASA missions. Decades later, the NASA astronaut corps still faces diversity challenges. Poised to become the first African American to complete a full-duration mission to the International Space Station, astronaut Jeanette Epps was pulled from her launch in 2018, leaving another glass ceiling intact for African Americans in space. This week's episode features Margaret Weitekamp, a curator at the Smithsonian National Air and Space Museum, and Jeanette Epps, a NASA astronaut. It's my hope that I fly in the Soyuz because I actually finished all of the work and all of the training for the Soyuz. NASA's Space Shuttle has launched more astronauts to outer space than all other space vehicles combined. But instead of being remembered as a workhorse for human spaceflight, the most retold stories of the Space Shuttle are stained with tragedy: two disasters that killed 14 astronauts during flight. On February 1, 2003, the NASA Administrator was on the runway waiting for the Columbia Space Shuttle to return home. Instead of greeting the world's newest space pioneers and welcoming them back to Earth, he was tasked with informing their families and friends of their terrible fate. This week's episode features Sean O'Keefe, the former NASA Administrator who oversaw the agency during the Columbia Space Shuttle tragedy. People feel a sense of pain, sorrow, and tragedy when things like this occur. Organizations don't. This week's episode features Luca Parmitano, an Italian astronaut, and Dava Newman, a professor at MIT and a former NASA Deputy Administrator. Humans use fear to get out of trouble. Thomas González Roberts is Moonstruck's host and executive producer. Thomas is a docent at the Smithsonian National Air and Space Museum, a space policy researcher at the Center for Strategic and International Studies’ Aerospace Security Project, and a producer and co-founder at DraftHouse Media. He studied astrophysics and Russian language at Princeton University. Read more of his work here. Grace May is a producer and editor at DraftHouse Media. Savannah Marquardt is an editor at DraftHouse Media. Kaitlyn Johnson is a research associate at the CSIS Aerospace Security Project. Listen to Moonstruck on iTunes, Stitcher, Spotify, Google Play, or wherever else you get your podcasts. Subscribe to get each episode as soon as it comes out. Or sign up to get a note in your inbox whenever a new episode is available (plus bonus content!). Be the first to know when Moonstruck's first episode is available on iTunes. For weekly episode updates during the season, check the box below to subscribe to the Moonstruck newsletter! Let us know what you think of the show or share your own story from the history of human spaceflight.